Notes towards an index of bookbinders who are named in the catalogues of booksellers and auction houses. 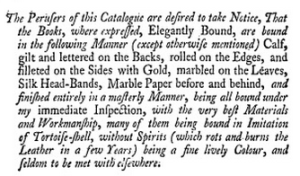 At present, the oldest example known to me of a named bookbinder in an English catalogue is in Thomas Payne’s 1754 (ESTC T21581), and the binder is Montagu, presumably the Richard Montagu of St. Giles in the Fields noted in Howe. The formula “elegantly bound by Montagu” is given, and this phrase will be used of select binders through to the 19th century. Many copies are described this way in the same catalogues without reference to a specific binder, along with other degrees of binding. The majority of booksellers seem not to have taken the trouble to name binders, and so far the practice can be said to be that of the West End. The title page of Cadell’s 1768 Select Catalogue of the Most Approved English Books carries the statement, in parentheses, “And many of them bound in various elegant Bindings by Johnson, Campbell, Fraser and other the best Binders” (sic). By 1770, Thomas Payne and Benjamin White catalogues list copies “elegantly bound” by both Johnson and Roger Payne, perhaps indicating a transition from one generation to another. 1770 is also the year in which Baumgarten first appears. In their 1781 remonstrance of booksellers, the bookbinders themselves named their best exemplars: “We have seen, during that Time, a Robiquet, a Johnson, a Roger Payne, and a Baumgarten arise in the Hemisphere of Bookbinding.” Baumgarten was the first of a number of Einbandkunstler who found their way to London from Germany, perhaps via Paris, where the finishing of bindings was a trade independent of binding itself. For the next decades, German names populate the roll call of fine binders in London: Hering, Kalthoeber, Welcher, Staggemeier, Walther, Lewis (né Ludwig).